In 2007, a wacky little diesel-electric hybrid concept called the Citroen C-Cactus was unveiled at the Frankfurt Auto Show. 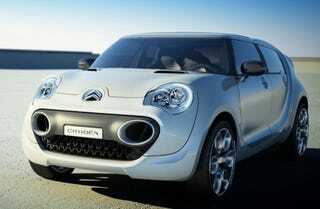 Now, according to Automobile, those crazy Frenchmen may put it into production. Though the diminutive hybrid was upgraded with a liberal dose of green paint when we saw it on the stand at the Paris Motor Show, the Cactus retained its small diesel motor, hybridized powertrain and minimalist interior, which would all be refreshing changes to the market if they made it to production. Imagine the fuel economy of a diesel combined with the mileage stretching ways of a hybrid — what a concept!